It had been over one month since we'd come back from the Dolomites in Italy, and we hadn't had a chance to get out at all during that time period. 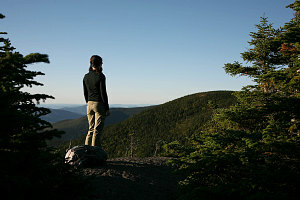 In fact, this was the first time in many years that I had not been out in the mountains at all in August. Family visits, preparations for Jenn's upcoming post-graduate studies in September, and general business all conspired to make a hike in August not possible. We resolved to get something in before Jenn starts school next week! 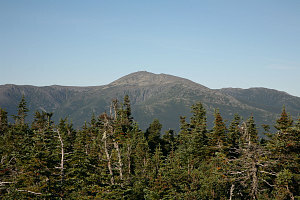 Originally I had planned two hikes over the Labour day long weekend, but horrible traffic in Montreal so delayed our arrival in the Whites that we had to change our plans and go for just a single outing on the Sunday. Originally I was going to do a loop involving Mount Isolation, a mountain and an area in the Whites I've yet to explore, but after some contemplation I realized that I'd like to do Mount Isolation as a south-to-north traverse. 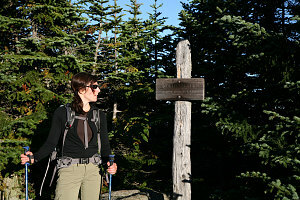 We decided in the end to knock off a few more peaks in the Carter Range. We'd last tried to do this with Caroline in June, but bad weather cancelled the attempt. 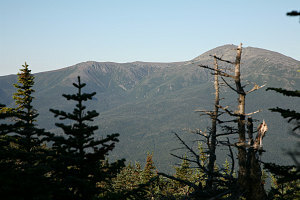 Trying to find a free campsite in the Mount Washington area on a beautiful Labor day long weekend was impossible. In the end, we decided to find an abandoned side road not far from Gorham and just laid out the sleeping bags in the back of the CRV. Free, and made it easy to get up super early and start our hike. Maybe we could catch the sunrise at a lookout! 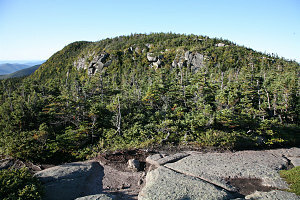 Our plan was to park at the 19-mile brook trail, bushwhack over to the Imp trail, and do a loop that included North Carter, Middle Carter, and South Carter. If we felt like it, we could easily tack on Mount Hight and Carter Dome. 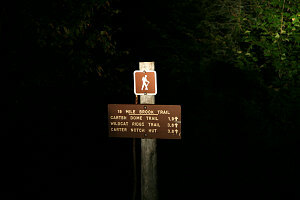 We arrived at the trailhead at 4am, had a quick cold breakfast, and then, headlamps on, started off under a cool, crisp, starry sky. 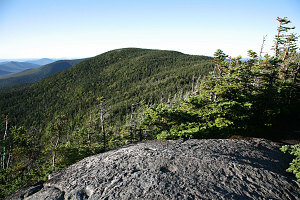 Under a waning gibbous moon, we hiked for about 15 minutes up 19-mile brook trail before veering off left into the woods. It was about a 1 kilometre bushwack from here to the closest point on the Imp trail. The bushwhacking was at times fairly open, and at times a bit brushy and annoying. 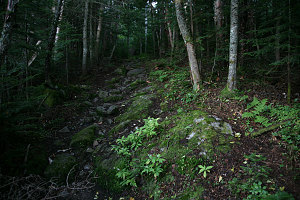 There was a fairly large clearing partway through the bushwhack - possibly the remnants of old logging or a farmstead?. 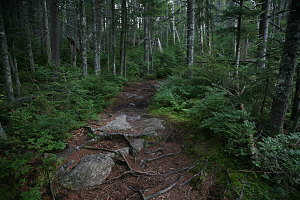 In any case, forty-five minutes after leaving the 19-mile brook trail, we intersected the Imp Trail. 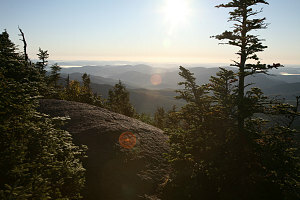 It was now a case of putting our heads down and seeing whether or not we could get up to a lookout before the sun rose. 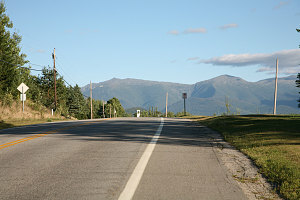 We were on the west facing side of the Carter Range, and any lookout would face towards the Presidentials, and I was hoping to get an alpenglow-type pre-runrise picture of them. Despite the fact that we burned uphill at a pretty good clip, we missed the sunrise. There are simply no lookouts on the branch of the Imp trail we were using (the Imp trail starts and ends on Highway 16 and describes a big 'U' that goes up and over a formation called the Imp, but that formation was on the section of the Imp trail we wouldn't be hiking on) up to where it meets the Appalachian trail on the crest of the ridge. 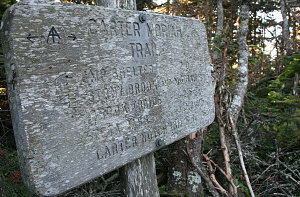 Upon reaching the ridgecrest trail, we headed left to the summit of North Carter Mountain. 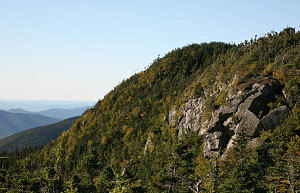 North Carter isn't technically one of the official 4000 footers of New Hampshire, but we were close and it was an easy walk, so why not? 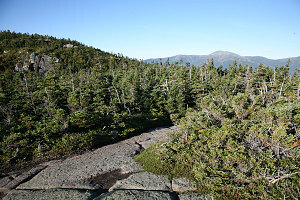 There is a beautiful little eastern-facing lookout just minutes before the summit, and we spent most of our time here, enjoying the beautiful early morning sun. It was quite cool up here, despite the sun - 5 degrees C (about 40 F). We retraced our steps to the Imp Trail / AT junction, and continued south. Our course for the next while was along the crest of the Carter Range, heading south for at least as far as Zeta Pass. 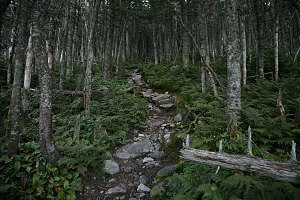 This section of trail (in fact, all of the trail along the crest of the Carters) is part of the famous Appalachian Trail, and I spectulated that we just might run into some Appalachian Trail thru-hikers. 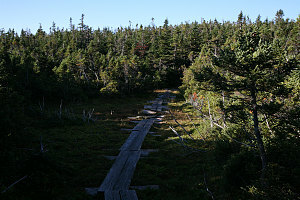 It was, after all, roughly the right time of year for north-bound thru hikers to pass along through this area. 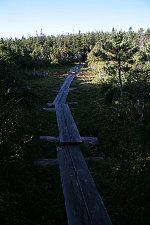 The trail from North Carter to Middle Carter is quite easy. 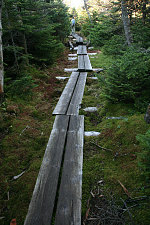 There is minimal elevation loss or gain, and the footing and trailwork is generally quite good. There is planking where needed and there are virtually no 'mud-hole' type areas. 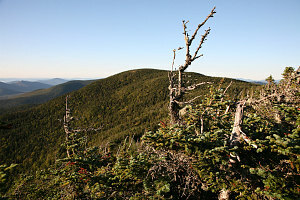 One gets occasional views to the east and west while hiking along the ridge. 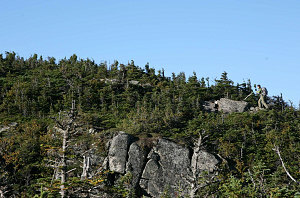 It is forested for the most part, but once in a while there will be a small outcrop or an area of low scrub. 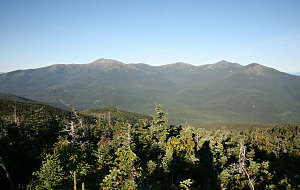 One then gets excellent views of the entire Presidential range, which runs parallel to the Carter Range just to the west.